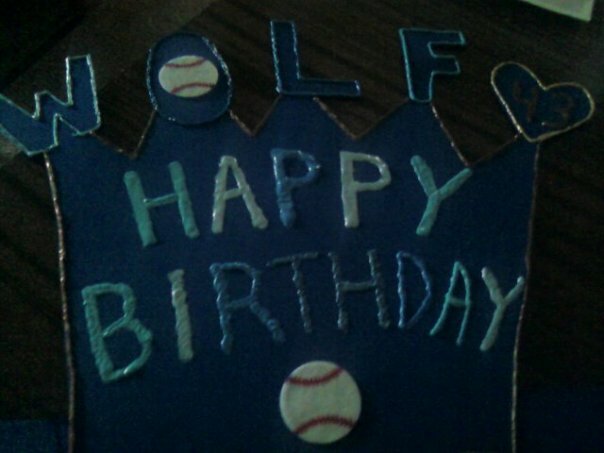 HAPPY BIRTHDAY TO RANDY WOLF AND JEFF WEAVER!!! I made these to take to the game on Saturday. And, no I didn’t make one for Jeff. I bought my tickets some time in July for this game. I have been looking forward to this game all year. 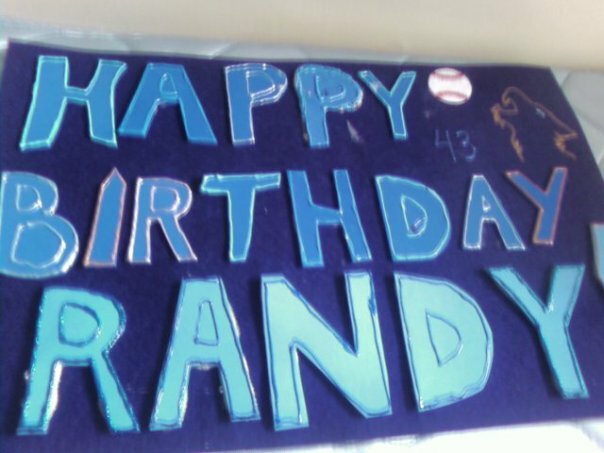 I knew I had to do something for Randy’s birthday since it was a home game and fortunately a day game. Why did I only make a sign for Randy and not for Jeff? Easy answer? Because I love Randy and he’s probably my favorite player right now. And as I told someone else, I knew Jeff wouldn’t give me the time of day whereas Randy would. So, what happened? Was I able to get the sign in? First, I got to the gate before 10:30. And I noticed there were three lanes of cars lined up … behind the “keep clear” about three hundred feet or so away from the gate. Now, I know that there are usually four to five lanes that line up a few feet away from the gate. And I know that I couldn’t start the fourth lane because that was in the left turn lane. So I drove right up to where the cars usually lined up. It was a long time before anyone pulled up. No one who was already lined up moved up. They finally moved behind us about eleven, ten minutes till the gates opened. As soon as the gates opened, I was the first one through. Therefore, I was the first one to park. I got a nice spot in the shade. When I got to the stadium gates, they weren’t ready to open yet. There were less than a handful of people waiting for the gate to open. I was in and ready to go. 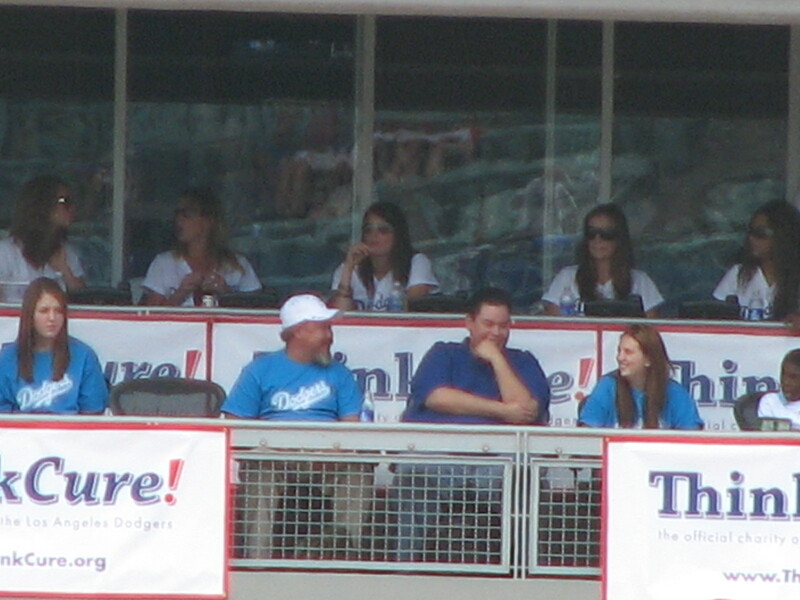 First I saw Kuo, Weaver, Kershaw with Honeycutt and I think Flippo. Kuo was throwing a bullpen session I think. I yelled happy birthday to Jeff, but he didn’t even look my way. Good thing I didn’t spend hours making him a sign too. Rick looked at me, so I said hi to him. Kuo and Rick went into the bullpen. 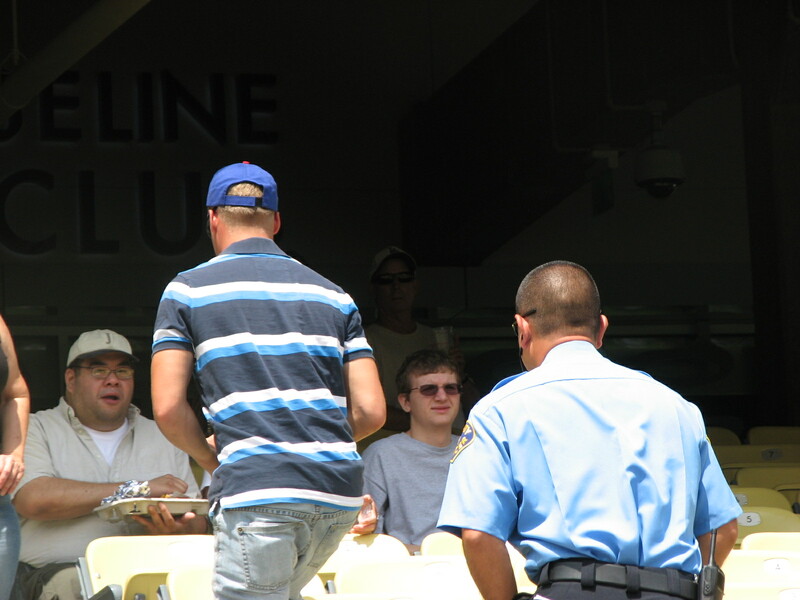 Someone in the pavilion was asking Kershaw for his autograph. He said he had to do a bullpen session. He asked Rick something. Rick told him to go take some photographs or something like that. Hmmm maybe he was telling him not to. 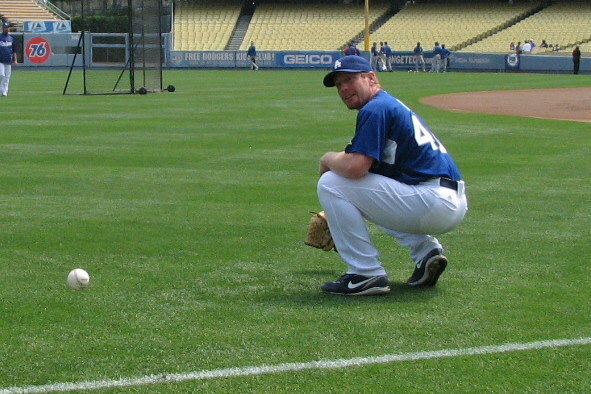 Because Kershaw picked up a ball and started playing catch with Weaver. At this point, I gave up on them and spotted my target. It didn’t take long! The ball got away from Wolfie. I love the picture! You can totally see the ball bouncing away. 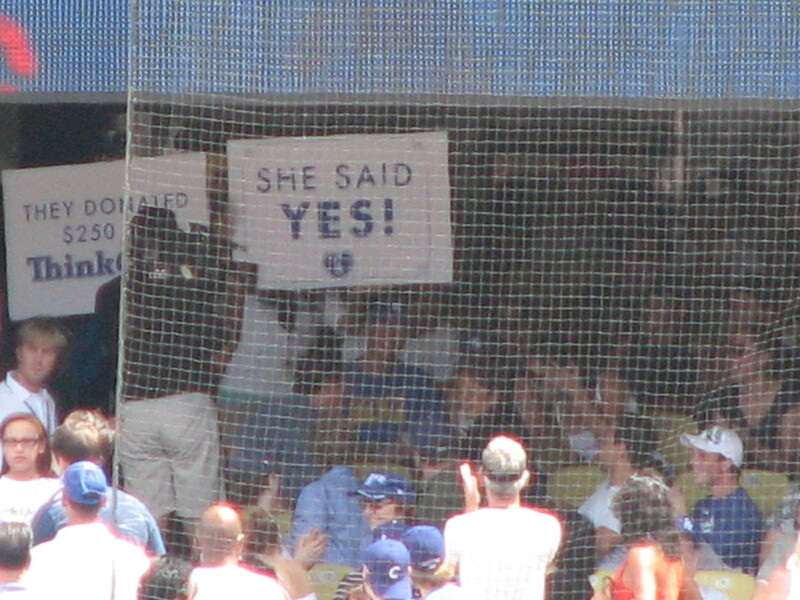 As soon as he turned and started walking towards the ball, I yelled out his name and held up my sign. He looked at me, smiled (he might have been laughing too) and said…. 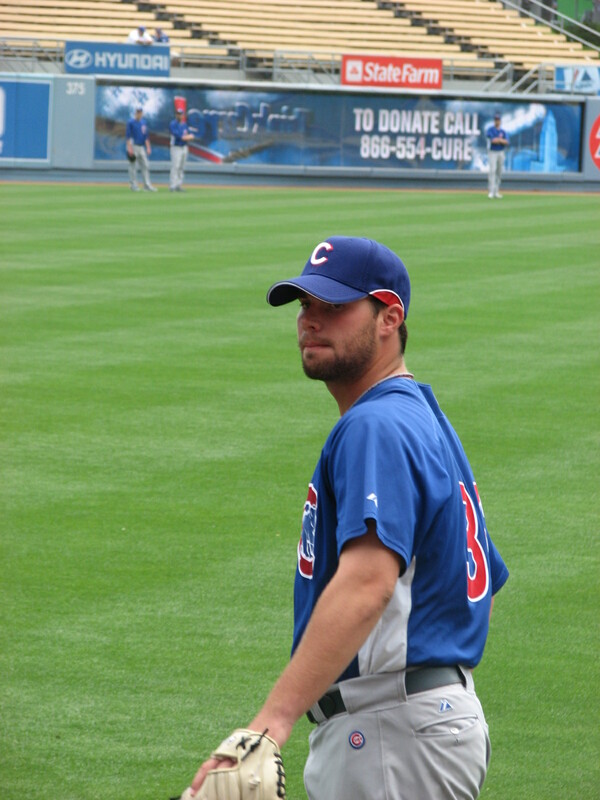 “Nice hat.” He continued throwing with Troncoso I think. 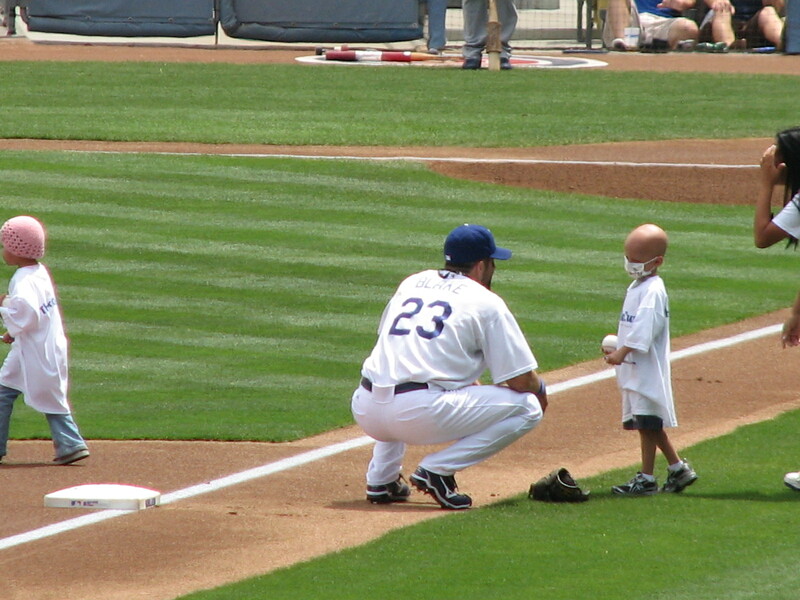 When they were done, he looked at me and said, “here, for you.” He tossed me the ball. I was “deer in the headlights” when he did that. I was like, “who??? ME??? ?” I was so afraid of not catching the ball. It was an easy toss. My head was frazzled by then from the “nice hat” comment. Throw this in and forget it. I was beyond frazzled. But not enough to let the next opportunity pass me by. He was signing for some people to my right. So I grabbed the pen out of my purse, made my way over and asked him to sign the ball he just gave me. He said of course, and wrote “nice hat! Randy Wolf” on it. I was in Blue Heaven by then! Forget cloud nine. I was in Blue Heaven. 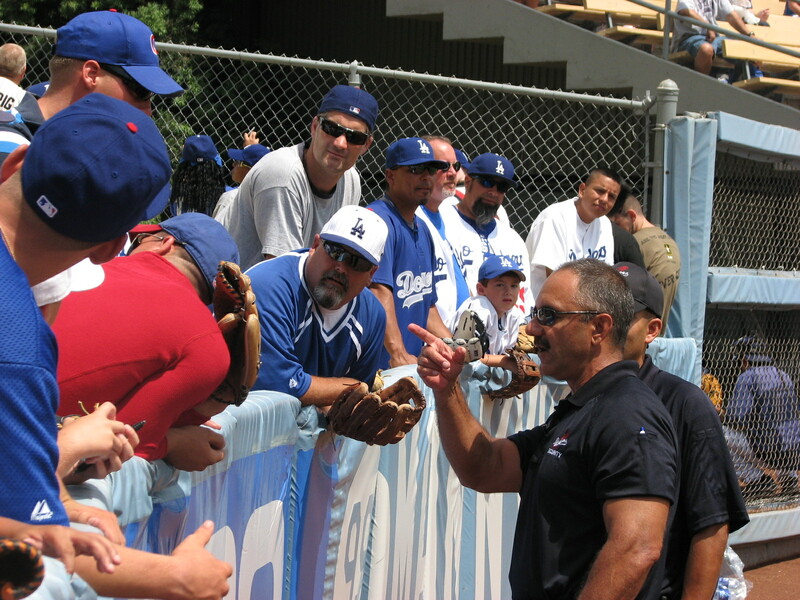 He then went over to the Kidde Korral and signed some more autographs. What a nice guy!!! On his birthday too. I thanked the ushers for letting me go down. 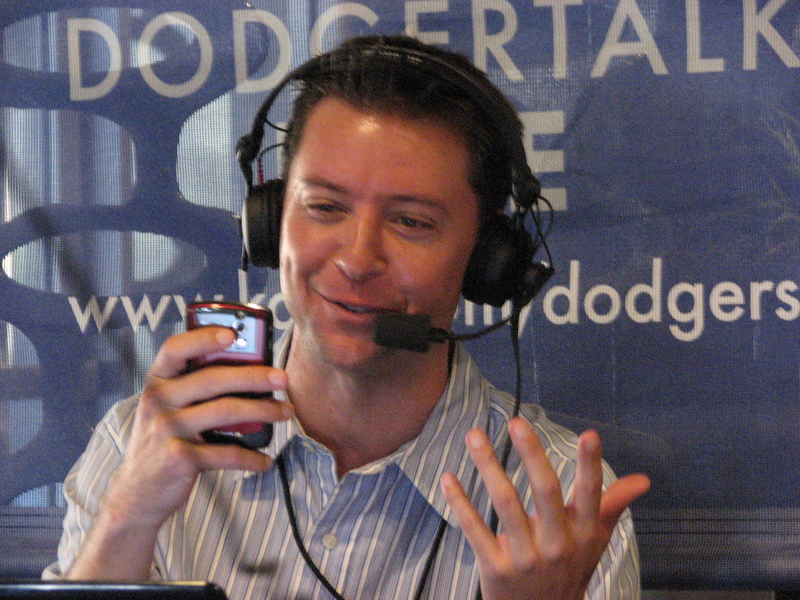 And he didn’t sign on the sweet spot, because the Dodgers WIN logo was stamped there. I made my way to where I usually meet Cat. 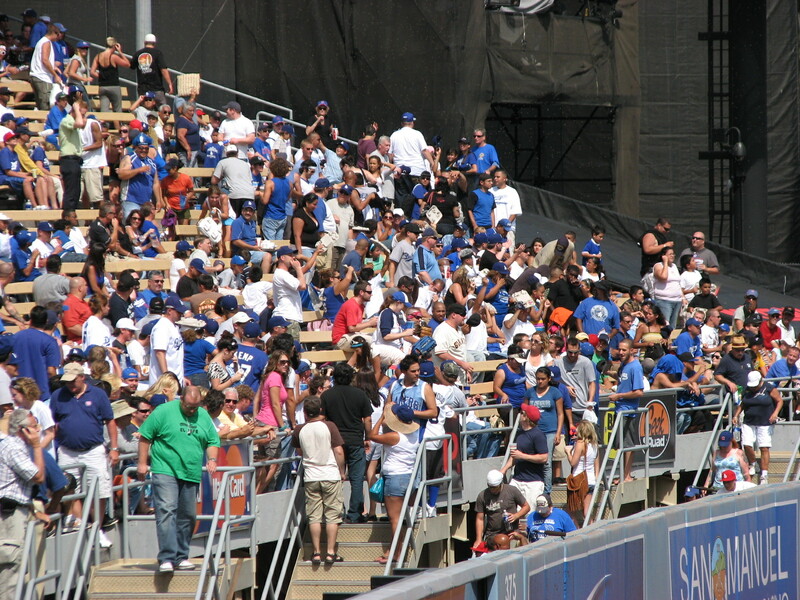 (Tip: if you’re wearing flip flops at Dodger Stadium, watch your step. Water + floor + flip flops = me slipping on floor, catching myself on the chairs before falling on my rear). I showed her the ball and the guys behind her were like, “cool! How did you get that?” I told her my whole story. She was very happy for me. 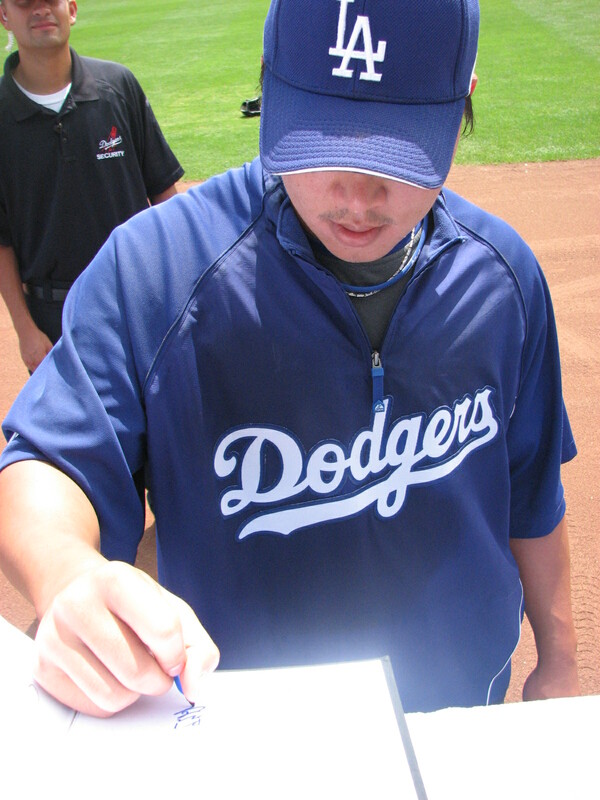 Hong-Chi Kuo was signing autographs and I brought out my scrapbook and had him sign in the inside cover. 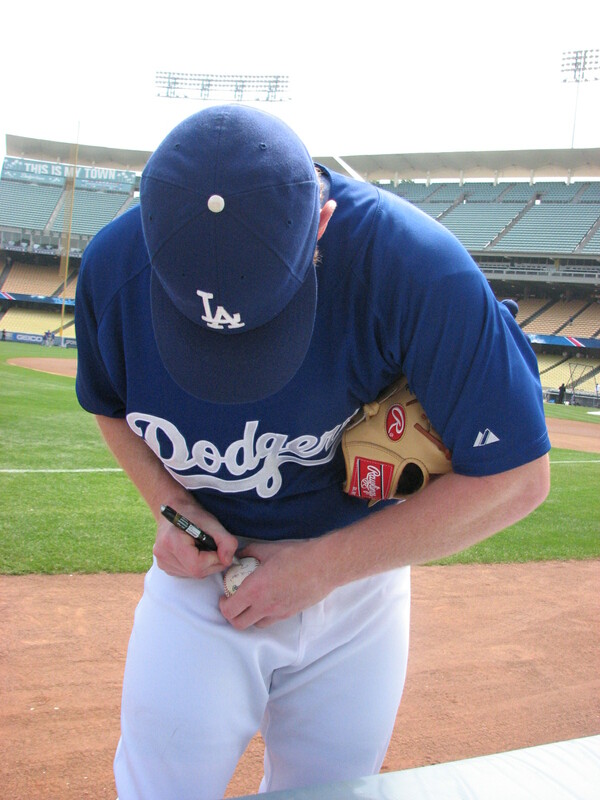 What’s with left-handed pitchers signing autographs with their right hand? en thinking about Randy. It’s like having a slice of Tiramisu cheesecake (or fill in your favorite cheesecake)… and then someone gives you a slice of regular cheesecake after you had your favorite. You’re not going to eat the other cheesecake once you’ve had the first one. A Cubs fan jumped onto the field for a batting practice ball. It wasn’t long before he was ejected. All for a BP ball. I know we all love when the kids take the field.Today’s kids just stole your hearts. There’s Casey’s kid. Hudson’s kid gets a hug! How adorable is that???? 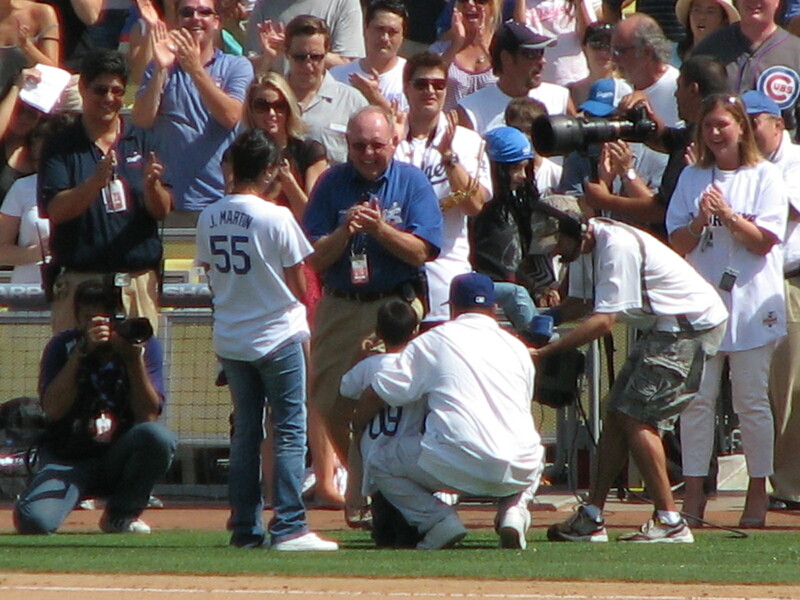 She also got another hug after he signed her ball. This week was “Think Cure” Week. 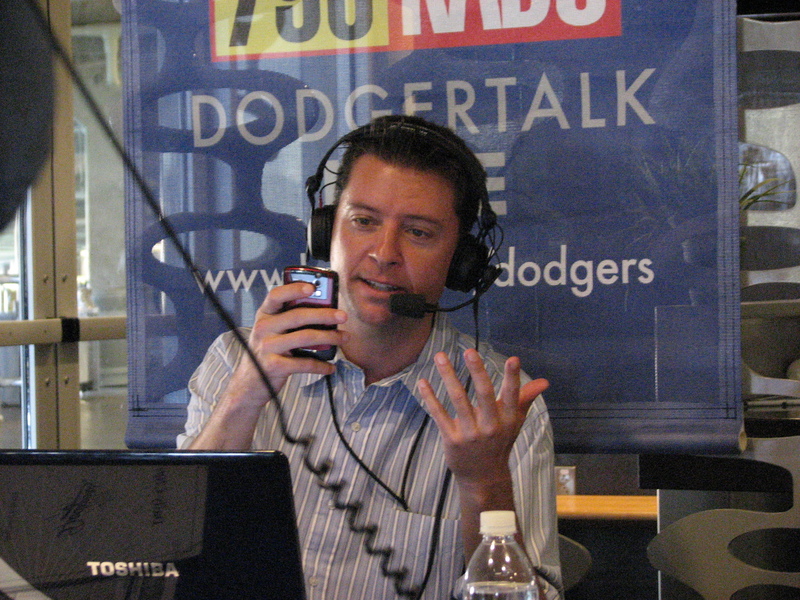 Not only did they have former players, Tommy Lasorda, and Frank McCourt calling contributors to thank them for their donations … they had the players’ wives (and in Marikym’s case, girlfriend) calling people as well. My friend JoAnna was one of the volunteers and she got to meet and talk with one of them. 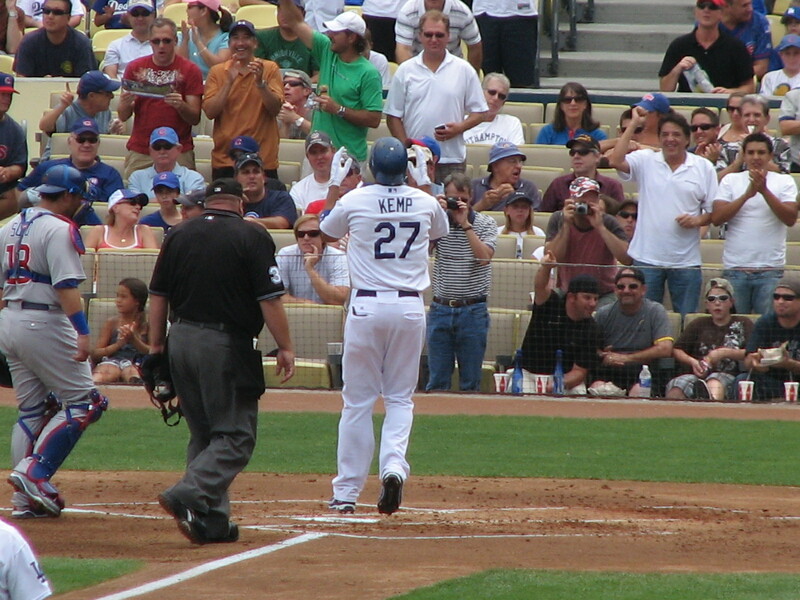 The Dodgers scored their first run on a monster home run by Matt Kemp. This thing nearly left the building. 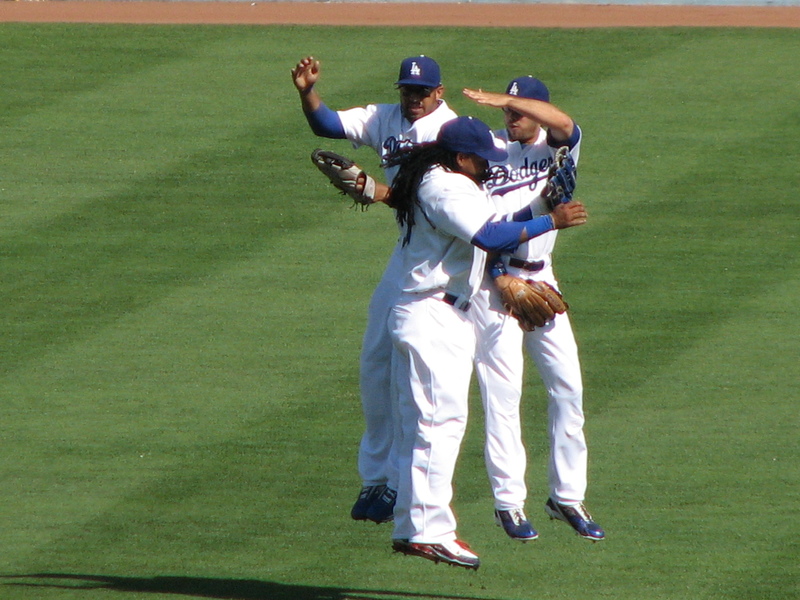 In fact … I think it’s still landing somewhere in Glendale! 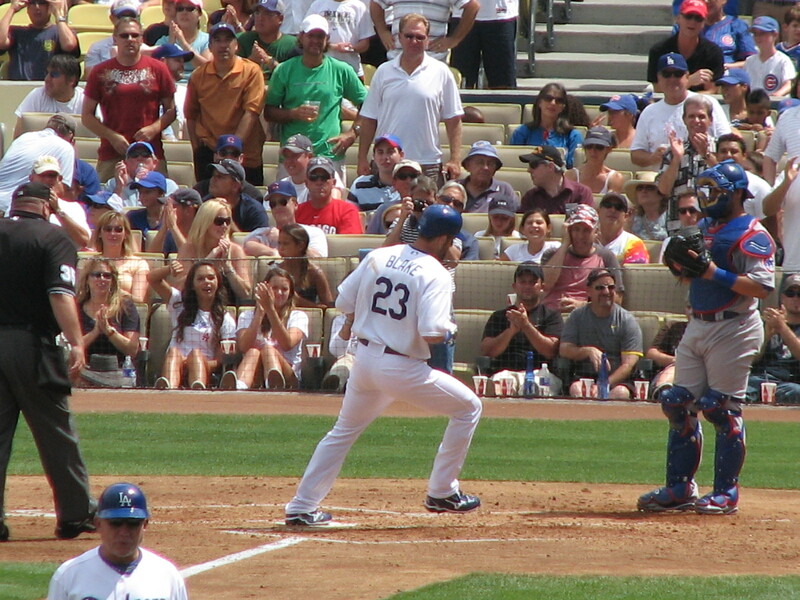 Then they scored another run on another home run… this time by Casey Blake. Continuing with the “Think Cure” tele-web-radiothon, this couple got engaged on the Kiss Cam. In addition to probably one of the best renditions of “God Bless America” I have ever heard … they had a little boy lead “Take Me Out to the Ball Game”. I don’t remember his name, but I remember seeing him and his family on the “Think Cure” telethon on Friday. After the seventh inning stretch, we noticed there were people still standing up in the Left Field Pavilion. And they were doing more than standing up! Yup! Bees! As Randy said in an interview with Darren Smith about the bees that invaded Petco Park last month, they must’ve ejected the queen bee and all the worker bees came with her. 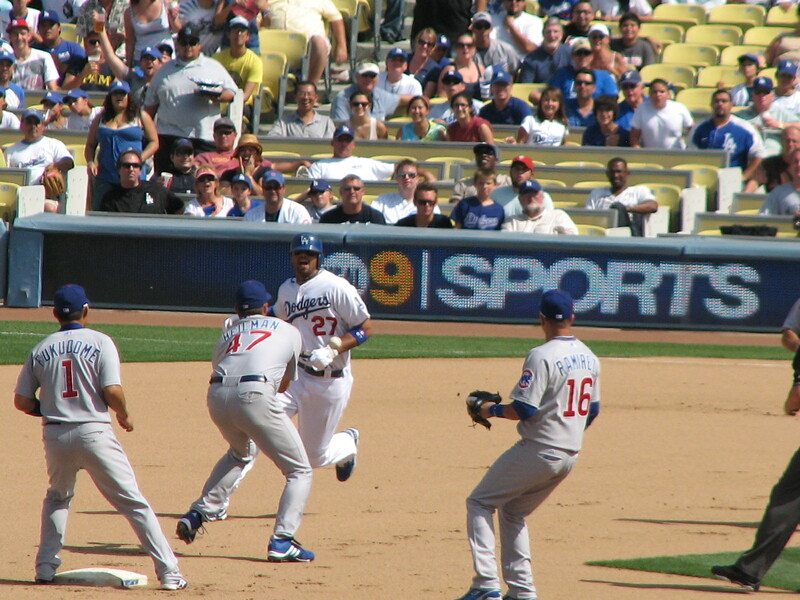 Matt Kemp running the bases. What was the final put out again? Sounded like a text number! 2-6-3-4-6-1. Catcher to shortstop to first baseman to second baseman to shortshop to pitcher! And where did Fukudome come from??? That would’ve been interesting to throw that in there. 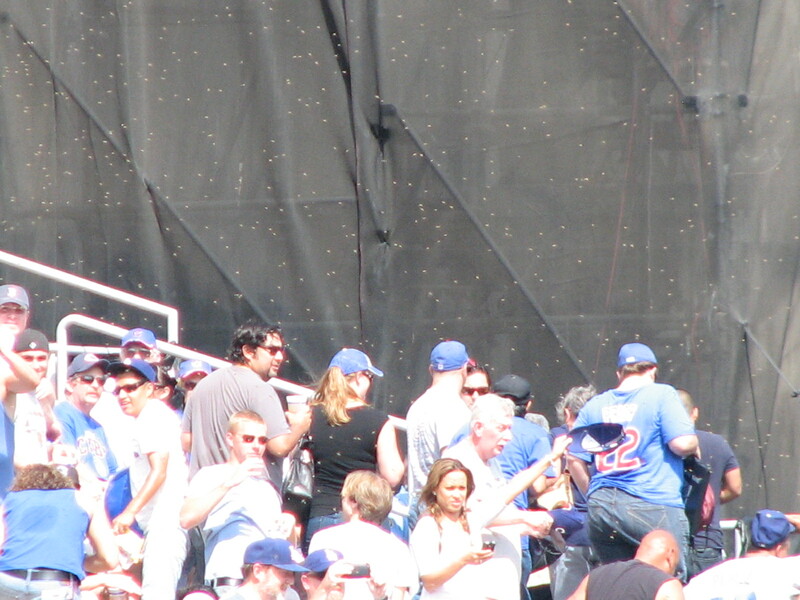 With all those Cubs swarming Kemp, it reminded me of the bees in Left Field. LOL maybe that’s where Fukudome came from. He wanted to get away from the bees who were migrated from the Pavilion to center field. In fact, one bee even made it all the way to where Cat and I were sitting. 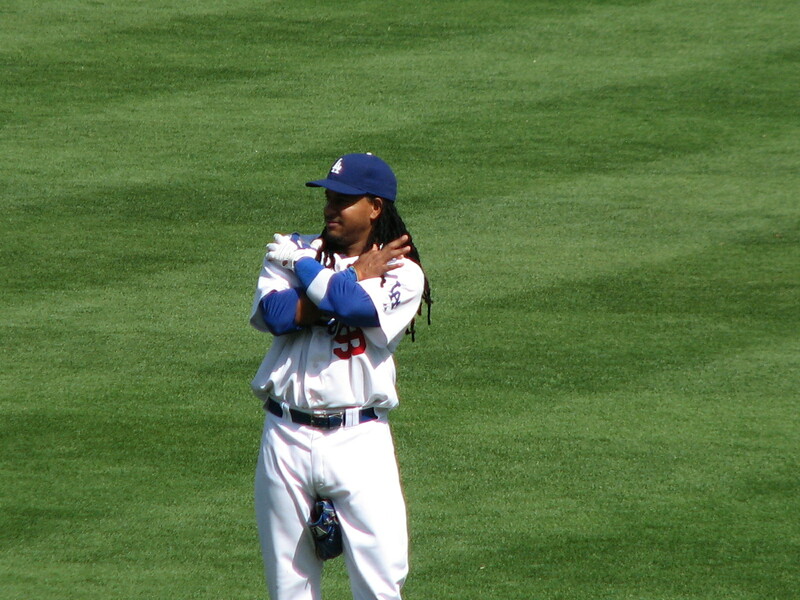 Manny playing around during the pitching change. the Left Field Pavilion. No one stepped up. I showed him the picture I had. He told me to get in line and say something. I told him, I don’t know what to say. I wasn’t there. I just saw it from a distance. creation of virtual bronze plaque listing each donor at thinkcure.org. who contributed $250 or more. 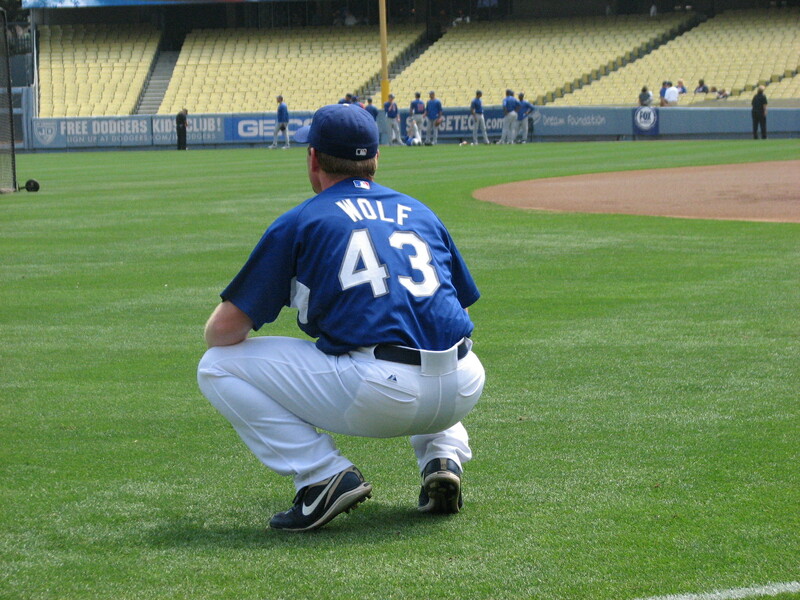 Oh, and not only did the Wolf hat get me a chance to get a ball/autograph from Randy … I got my picture taken quite a few times … a rarity for me! Cat took it twice (once without me knowing till it appeared on her blog), Mickey took it three times (for the Dodgers’ fan photo. 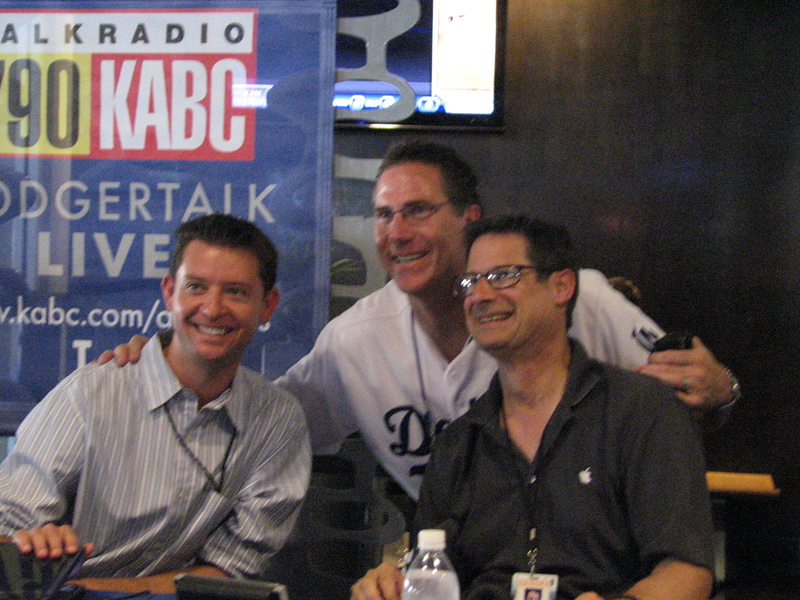 Go to Game August 22, Galleries 2 and 3), one of the KABC girls once in the baseline club, and then one of the KABC guys (who knows me) took one too. 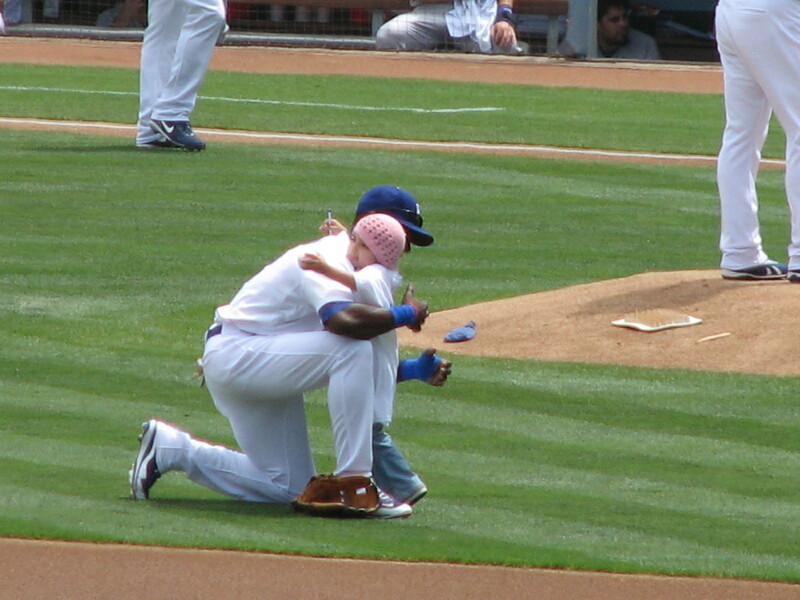 After the Dodger talk, they had people who made donations of X amount on the field playing catch. As I was leaving, I saw two people in the bullpen. I wonder how much do you have to donate to be allowed to make out in the bullpen room. I’m glad I paid for parking today. 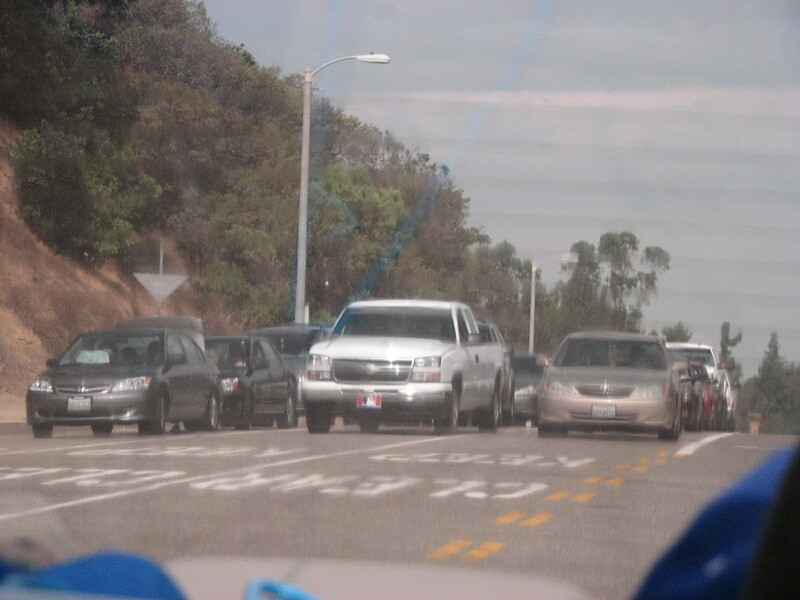 By the time I left, I think only the main gate (Elysian Park) was still open.